Eilean Donan castle is incredibly beautiful – and internationally famous. Eilean Donan is probably the most photographed fortress in the whole of Scotland, and has featured in movies such as James Bond (as the Scottish HQ of MI6, no less). The castle guards a small island, deep in the Scottish highlands, at intersection of three tidal lochs. An arched, grey-stone bridge connects the castle with the mainland. And hundreds of thousands of tourists stream across the bridge every year to explore this beautiful, misunderstood fortress. What a lot of visitors don’t realise is that Eilean Donan isn’t an ‘authentic’ Medieval castle. Virtually everything you see today was built in the 1920s-30s, in a mock Medieval style. Nonetheless, there has been a castle on this island since way back in the 1200s. The modern castle was built upon an enigmatic pile of ruins. With its stunning good looks, it’s easy to see why Eilean Donan is such a popular tourist-spot. Little of it is truly Medieval, though! Credit: A_Poll_o, CC-SA-2.0. ‘Eilean Donan’, pronounced aye-lean don-an, unexcitingly means ‘Isle of Donnan’. Donnan was a Celtic saint martyred in about 617, and it’s said that his followers once built a church upon the island – although we’ve little evidence of that. Scottish legends say that the castle was founded by a mysterious warrior, blessed with the skills to talk to birds after drinking from a raven’s skull at birth (see ‘the legend’, below). More prosaically, a castle was probably founded here in the 1200s as it was in a fine position to defend the lands of Kintail from viking invaders. Back in those times, ships battled upon oceans and lochs, and Kintail was part of a ‘sea kingdom’. The Isle of Donan guarded the passageway to Loch Long and Loch Duich and the lands beyond: it was an enviable position. And so the very first castle was founded to guard these waters from the sea-faring vikings. Old highland legend says that a baby who takes his first drink from a raven’s skull will be blessed with strange powers. There was a clan chieftain in Kintail who gave his son Shamus such a sip. For a long time, Shamus seemed to be a normal, happy child. Then one day his father found his son seated beneath a tree, talking to the birds within in their own strange language. His father was horrified, and forced Shamus to hide his strange talent. Eilean Donan against the wooded shoreline. Credit: Vadim Kurland, CC-BY-2.0. That was until one night when they ate in the smoky hall of their ancestral home. The birds on the beams above made a terrible noise. Out of curiousity, Shamus’ father said, “tell me son, what do they speak about?”. Shamus’ father, terrified by this strange prophecy and his son’s unnatural skill, banished his son from his hall and told him never to return. And so Shamus had to make his way in the world. He travelled from France to Spain, England to Ireland. Everywhere he went, he used his strange skills to command the birds around him to do his bidding. He became a hero of war, as birds passed him secrets from the enemy line. Many years later, a rich man sailed up to the clan-house of the chieftain of Kintail. Shamus’ father was still chieftain, was now an old man. Out of hospitality, the old man brought his rich guest a drink. Pulling back his hood, Shamus said, “Father, it’s I, your son. I come back to make amends, and the prophecy is now complete!”. Delighted to be reacquainted with his son, his father cried with joy. The return of this legendary warrior spread around Scotland, until it reached the King. Owing to his wealth and his magic talents, the King made him guardian of the island of Eilean Donan. And this is where Shamus founded the castle that’s rebuilt today. The reflective beauty of Eilean Donan on a sunny summer’s day. Credit: Bryan Pocius, CC-BY-2.0. All the evidence we have (although do be warned, there isn’t a lot of it) says that the Medieval Eilean Donan castle was much larger than the fortress today. A tall, stone ‘keep’, with a base of 12x12m, was built upon a tall rock at the highest point on the island. A thick curtain wall encircled the lower part of the isle; with a sea-gate for access. The original Medieval sections of Eilean Donan were built upon this tough, jagged bedrock. Credit: Loz Pycock, CC-BY-SA-2.0. One old source says that Eilean Donan Castle may once have been as many as seven towers. We don’t know for sure, but it seems like the main ‘keep’ was transformed into a Tower House (a fortified residence, basically) in the 1300s. Some say that Robert the Bruce hid out here during the winter of 1306, but there’s really no evidence to support that, so take it with a pinch of salt. During the c15th, the castle contracted in size to become one, compact, fortified tower, poised to defend itself from any sea-bourne threat. These towers were rebuilt in the c20th in a decorative, mock-Medieval style. Credit: Loz Pycock, CC-BY-SA-2.0. The reason we know so little about medieval Eilean Donan castle is because the fortress was blown to smithereens in 1719. The castle was involved in the Jacobite risings – series of rebellions and battles aiming to restore the last Catholic monarch, the exiled James II, to power. In fact, the Scottish highlands were a hotbed of rebellion. In 1715, Spain stuck its oar in, and sent troops to support the Jacobite cause. (To simplify things slightly, Spain was battling Britain and France in war in Europe, and this was a good way to destablise the Brits in their own backyard). 300 Spanish soldiers were sent to Loch Duich, and 46 garrisoned Eilean Donan. When the British got wind of it, the navy sent up three tall ships to prevent an insurrection. On arriving at Eilean Donan Castle, the HMS Worcester, Enterprise and Flamborough attempted to negotiate a truce. However, it’s said the Spanish soldiers fired first. As a result, the castle was bombarded for about two days – a testament to the thickness of the walls. When the Spanish garrison at last gave up, the men were taken prisoner elsewhere in Scotland. To prevent the same thing from happening again, the Royal Navy used many of the 343 barrels of gunpowder stored in Eilean Donan Castle to blow up the remaining walls, and destroy the fortress for good. Or so they thought…. For the next 193 years, the ruins of Eilean Donan castle were forgotten. They were left to crumble and decay. This photograph, which was taken before 1911, shows the castle in its ruined state. As you can see, there really wasn’t very much of the castle surviving at that time – and it certainly looks nothing like the fortress of today. In 1912, the fabulously named Major John MacRae-Gilstrap (born 1861) bought the ruined castle for £2,500. Like so many men before him, Major MacRae-Gilstrap had dreams of greatness, and wanted to build a castle to prove his worth. It seems the Major thought that owning a castle would help him claim the ancestral title of Constable of Eilean Donan. With this plan in mind, he set about rebuilding an idealised version of Eilean Donan castle, loosely based upon the decaying ruins. The modern castle, rebuilt in the c20th, is based on old plans from Medieval times. Credit: SephRademakers, CC-BY-SA-2.0. After drawing up all manner of fantastic plans, they started to build the castle after World War I ended. It’s worth emphasising that Major MacRae-Gilstrap designed the castle to look beautiful. His aim wasn’t to create a faithful reconstruction of the Medieval fortress. Indeed, the chief of works is said to have based the designs upon a dream he had of what the restored castle might look like. Although they rebuilt the modern Eilean Donan on the footprint of the Medieval castle, they added and exaggerated lots of features. These include the delicate machicolations, some of the spindly, teetering towers, and the grand entranceway. It took 20 years for the castle to be completed, but it wasn’t opened to the public until 1955. 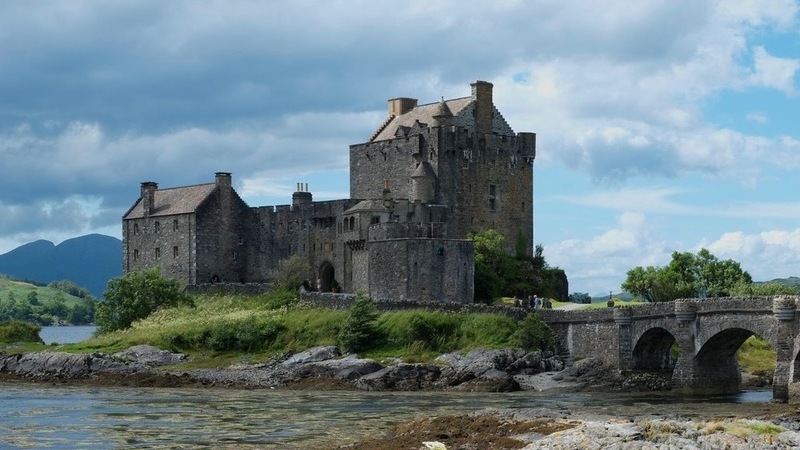 Tens of thousands of tourists visit Eilean Donan each year, and you can embark on a guided tour of the castle. Inside the castle, you might be impressed at all the modern amenities! From the get-go, the castle was hooked up to electric lighting, and even had a complete central heating system. One of the rooms of Eilean Donan, filled with mock-Medieval details. Credit: Shadowgate, CC-BY-2.0. The rooms of the castle are full of mock-Medieval grandeur. The Billeting Room has a fantastic, barrel-vaulted ceiling made from stone. The Banqueting Hall has a grand ceiling made from the finest douglas-fir: and even has a series of ‘secret’ spy holes, built into the building as a little joke. Above the door to the castle, you’ll see the most important element of all (and the reason Eilean Donan was rebuilt in the first place! ): the coat of arms of Major MacRae-Gilstrap. By rebuilding Eilean Donan – nowadays, one of the most visited castles in the whole of Scotland – he undoubtedly made an enduring name for himself. If you’d like to discover more spectacular Scottish castles, I’d recommend a trip to the strange, triangular shape of Caerlaverock Castle. 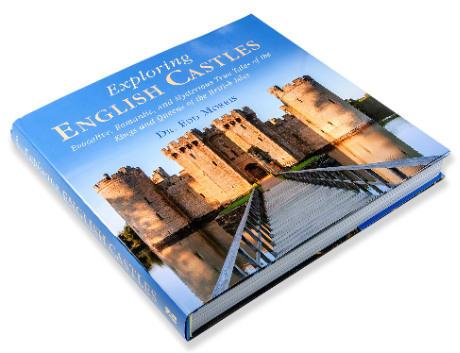 Or how about uncovering the history of Edinburgh Castle – one of the enduring images of the Scottish capital?